The number of inventions that have provided ample innovation only to fail to stand the test of time is proof enough that one cannot stand still for long in an evolving market. As Mia Hamm, a world-famous footballer (soccer player) from the US put it, “It is more difficult to stay on top than to get there.” From the industrial revolution to the present day the continual evolution of manufacturing practices has proven that this statement does have truth to it. A review of the history of circuit board manufacturing, which effectively began in the mid-twentieth century, reveals that PCB manufacturing has also had significant advances. Typically, the desire to improve quality or efficiency has been the catalyst for advancing manufacturing practices. And although these drivers remain, other motivations have been added that are guiding the search and adoption of new manufacturing methods and processes for PCBs. One of these new motivations, sustainability, is concerned mostly with how manufacturing impacts the environment. Let’s explore this new perspective and then see how to design for sustainable manufacturing of PCBs. environmental impacts while conserving energy and natural resources. In contrast to most traditional types of manufacturing, sustainable manufacturing is a broad strategy that extends beyond the factory production line. The emphasis on environmental impact is in-line with thrusts in other sectors, such as the energy and automotive industries, to minimize the harm done to the local or global ecosystem. This includes ensuring that people and other organisms are not hurt intentionally or inadvertently by manufactured products. Sustainable manufacturing can be viewed as an attempt to best merge the primary concerns of all parties that may be impacted by the creation of a product. These include the business’ profitability, the community’s ecosystem, and safety for everyone involved. Accomplishing this requires adherence to government and regulatory requirements, good business quality, and risk management and is best achieved by implementing advanced manufacturing strategies, such as those listed below. Lean Manufacturing: Lean manufacturing is the adoption and implementation of concepts and processes to remove waste from production, resulting in the most profitability without loss of quality. Agile Manufacturing: Having the equipment capability and expertise in order to respond to product changes quickly without loss of time or quality are essential attributes of an agile manufacturing process. Green Manufacturing: Green manufacturing is the term applied to production processes that seek to minimize negative environmental impact by reducing waste, utilizing recycling, minimizing natural resource usage and other practices. Additive Manufacturing: Additive manufacturing or 3-D printing, which creates 3-D objects by building layers upon layers, is a burgeoning technology that often utilizes composite materials. This method is cost effective and allows for the making of complex and lightweight products efficiently. The image below shows a 3-D printer in action. A sustainable manufacturing process may incorporate one or more of the above strategies or processes. 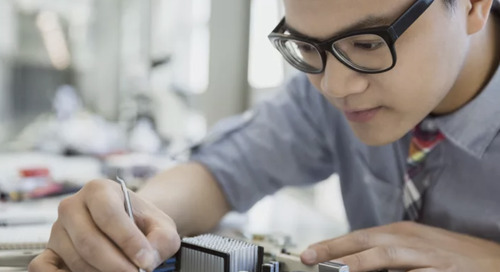 Although it is not common for board fabrication and PCB assembly to be guided by sustainability, all of the manufacturing methods above may be applied to the production process. This includes building single and multilayer PCBs with 3-D printers. To create the most effective sustainable manufacturing process requires that board design adopt principles and incorporate steps to support the board building process, such as those listed below. Select components that are eco-friendly: If available, use components that when used or discarded do not pose a harm to the eco-system. Additionally, recycling components from older boards can be beneficial as well as cost-effective. Choose materials that are eco-friendly: Whenever possible, opt for board materials that do not create byproducts that may be harmful to people or the environment. Minimize board size: Smaller boards require less material and use less energy. Applying this consistently can have a significant impact over time. Make good use of design for manufacturing (DFM): An important aspect of sustainability is efficiency; therefore, you should engage with your manufacturer and incorporate DFM rules and guidelines to minimize delays or additional costs due to redesign. Prioritize safety: You should also ensure that your product will be safe, which means having manufacturing and regulatory testing performed as needed. Following these PCB design for sustainable manufacturing guidelines will support your manufacturer in ensuring that your boards are environmentally friendly and safe. OrCAD by Cadence, a comprehensive industry standard for PCB design, includes all the functionality and capability you need to partner with your CM to produce high-quality, reliable boards including tools to promote and support sustainable manufacturing. To explore these capabilities for yourself, get a free trial here.